This famous old postcard shows the demolition of the old Old Vicarage, in preparation for the building of the Parochial Hall. The vicar of St Nicholas’ Church, to which the hall belongs, seems to be taking an unusually hands-on approach to the proceedings and is pictured here half way up a ladder surrounded by workmen. The Old Vicarage itself fronted onto the High Street and the Tithe Barn stood behind where the main Clarendon Hall chamber hall now stands. Joyce Powell recorded in Kenilworth History 2001 – 2002 how reverend William Best once lived in the vicarage: “The modest timber-framed building where he lived for so long and brought up his seven children survived until 1910, although by the end of the nineteenth century it had been degraded and referred to as ‘the vicar’s stabling’. The present Parochial Hall covers both its site, and, sadly, that of the great Tithe Barn”. Another account of the demolition can be found in KHAS Newsletter 31 from January 1969 based on a talk given to the Society by Mr R. Fancott, of the nearby Fancott’s Bakery: “Amongst the interesting things he recalled was the opening of the Parochial Rooms in the High Street. This building stood in the ground now occupied by the present Parochial Hall and it was originally the old tithe barn. It was bought from Lord Clarendon and converted into a much-needed Church Hall”. The foundation stone of the new Parochial hall was laid in 1910 by Edward Hyde Villiers, Earl of Clarendon and the hall opened in 1911. The hall is available to rent and its uses over the years have been many and varied. 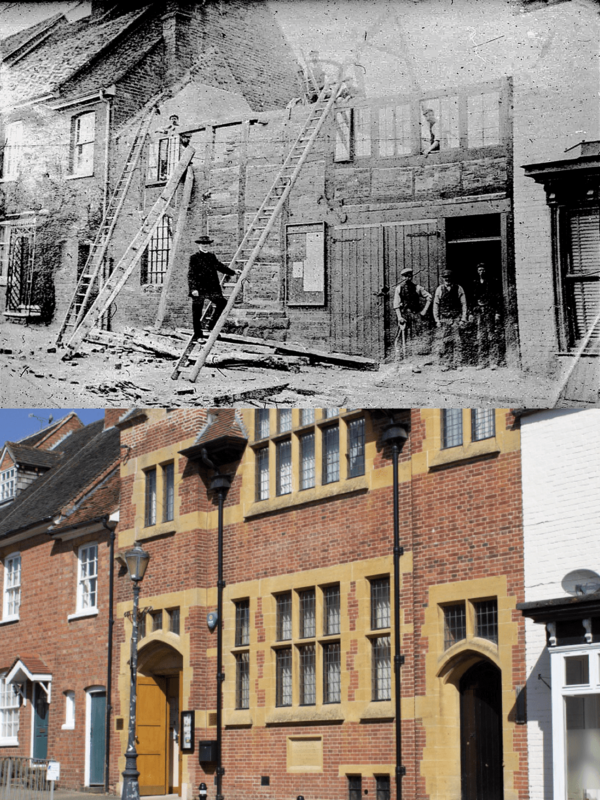 Reg Palmer recorded in Kenilworth History 1995 – 1996 that “The Scouts who were meeting in about 1910 probably met in a small hut or hall behind the present Parochial Hall or Meeting Room before the Parochial Hall was constructed. (The foundation stone of the present Parochial Hall was laid in 1911.) If this hut in which the Scouts held their meetings at that time is the one I remember from my early days in the Movement, then it has had a remarkably long existence as it is still to be seen, although it is only used as a store-room for furniture these days!”. KHAS Newsletter 26 from October 1967 records a talk from a Mrs I Phillips, Commandant, Warwick 6th Detachment British Red Cross Society, to the effect that “From 1915 to 1919 the “Red Cross” ran a hospital in the Parochial Hall to care for war wounded”. Nick Green and Derek Pickering recorded in Kenilworth History 2012 how the hall hosted the AGM of the Kenilworth Swimming Club in 1924. Harry Sunley recorded in Kenilworth History 1991 how ‘The Friends of Kenilworth Abbey and its Surroundings’ held its AGM in the Parochial Hall in 1932. Geoffrey Whiteman recalled in Kenilworth History 2001 – 2002 that “In the mid 1950s, a shortage of accommodation at St. Nicholas’ C of E Infants and Junior School, then located in School Lane, meant that two infant classes had to spend a year in classrooms at the Parochial Hall. Our homeward journeys tended to be fairly leisurely affairs and gave us daily opportunities to explore the Abbey Fields and St. Nicholas’ churchyard”. Robin Leach recorded in Kenilworth History 2013 how a public meeting was convened in the hall in 1913 to discus the response to a fatal typhoid outbreak. The Parochial Hall underwent a five year restoration costing £520,000 before it reopened in April 2011.